What Members and Non-members Ages 4+ Welcome! 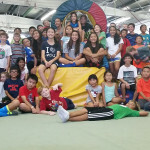 Students receive gymnastics and trampoline instruction on a daily basis, increasing their general and sport specific fitness levels. Students will be active for at least two hours of the morning and two hours of the afternoon (with snack and water breaks given throughout the day). Who: Members and Non-members Ages 5+ Welcome! Morning and afternoon sessions will include structured gymnastics lessons, hours of super-vised practice on the equipment, fun games, and enrichment activities such as cooking and arts and crafts. All participants will receive snacks throughout the day and full-day participants will receive lunches catered by various restaurants in the community.